It’s so nice to be moderately settled enough in our new home so that I can answer the weekly photographic challenges posed by on-line folk. This week’s theme from Where’s My Backpack? is big. On our third day in Mexico – and our third day after leaving Peru – (and once I was feeling better from the insidious effects of altitude sickness) the family, our host, and I travelled into the heart of Mexico City and visited the Museo Nacional de Antropologia. In addition to many other fascinating artifacts, this museum is home to the Aztec Stone of the Sun (often mischaracterized as an Aztec calendar), replicas of Mayan murals (such as those an Bonampak), and an Olmec head. As big as those above items are, there is one thing in this museum that fits this week’s photographic travel theme. After paying admission and handing in your ticket, the first thing the visitor sees of this museum is a large plaza. This plaza is not technically an open-air plaza, because there is a roof. Except it isn’t a roof. It’s an umbrella. 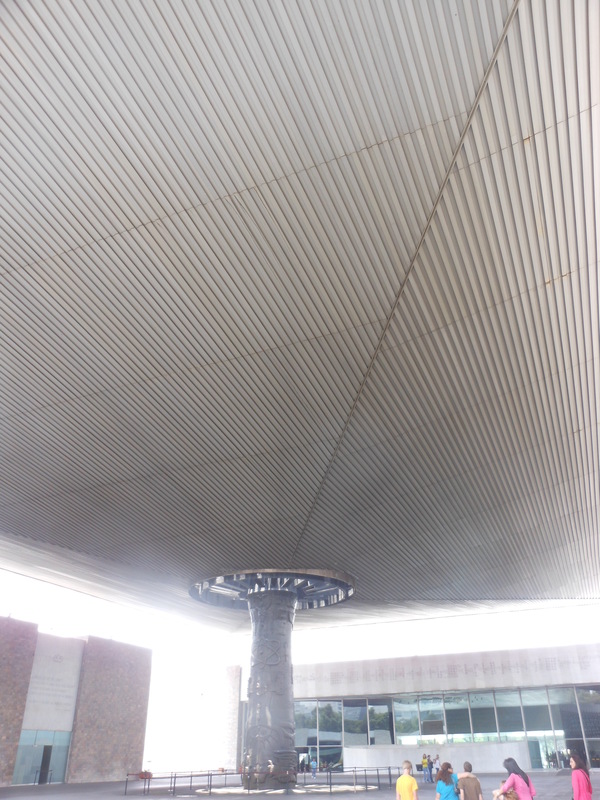 The covering that spans the entire plaza is held up by one single pillar. It is the pillar and the umbrella that are my answer to this week’s challenge. This picture doesn’t quite do justice to the bigness of the pillar and umbrella, so you’ll just have to travel to Mexico City to see for yourself. Posted on August 19, 2013, in Mexico, Photography and tagged big, Mexico, museum, photography, travel. Bookmark the permalink. 2 Comments.